Today I have something pretty different for you, since it's not my usual kimono post. Instead, I have a fairly easy and yummy recipe that my husband and I had accidentally discovering while making sushi, and which now became one of our favorite recipes. Of course, I've only been talking about this recipe to anyone who's willing to listen for I don't know... 6 month now? I even converted Hong to it, and she made it at home several times now! Well I figured it's time to share the greatness! Just to give you an idea, these are the rice vinegars that I have at my house at the moment. The left one (Mizkan Sushi Seasoning) is the most expensive and "hard to get" one because it's not sold at my base Commissary, so I have to buy it at the Japan Centre in London. It is also my favorite, so I use it for sushi rice only. The other two I can buy at the Commissary, so I use them for shrimp. Of course, I can also make sushi rice vinegar from scratch, but I'm lazy. Also, I want to point out that I HATE avocado and this is petty much the only dish when I can eat it fresh. 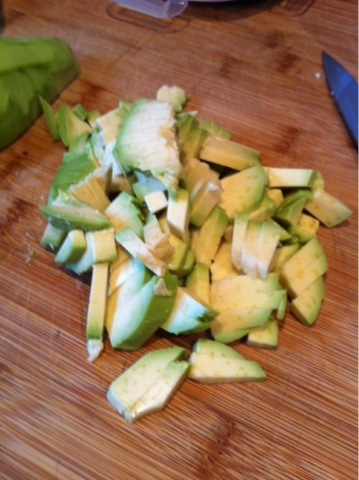 When combined with other ingredients, the taste is not overpowering but very nice, so do give it a chance if you also hate avocado. It's good for you! - 1.5 cups uncooked sushi rice. 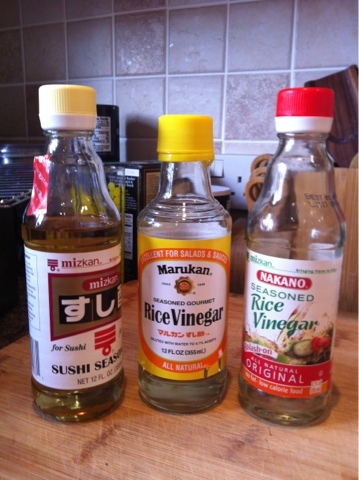 - 1 bottle of Sushi rice vinegar or seasoned rice vinegar. 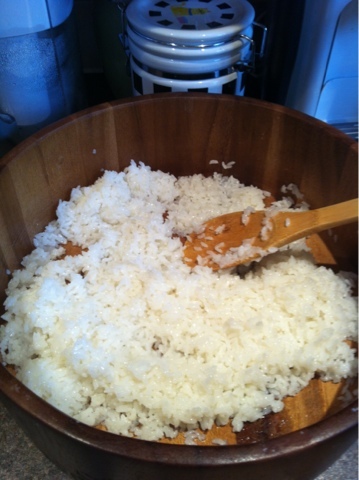 Step 1: Make sushi rice. 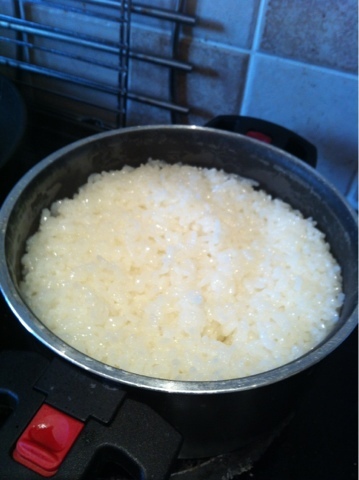 - 1.5 cup sushi rice, washed. - Either use a rice cooker, or cook it on stove top for about 20 minutes on low (reduce heat after the water boiled). - Pour 1/4 cup of seasoned rice vinegar over your rice, gently turn it over with wooden spoon, fan it like crazy with a fan (you know, one of those you can buy at any Asian festival. Magazines work too when in a bind), turn it over again, fan like crazy again, repeat until the rice cooled down to room temperature (I have to say, that this amount probably overseasons the rice, but I found that it doesn't really matter because at the end it tastes very good anyway. 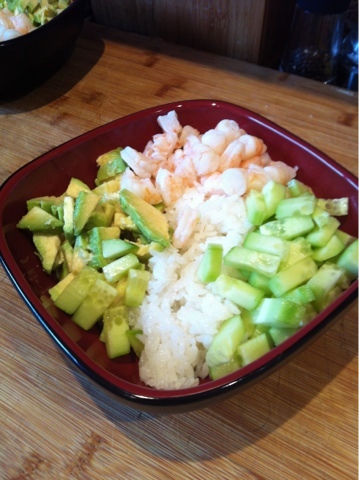 When I actually make sushi rice for actual sushi, I follow the recipe in my book). I buy the UNCOOKED bagged shrimp at the Commissary, I think about 20-22 count to LB, but you can buy whichever one you want as long as it's uncooked. 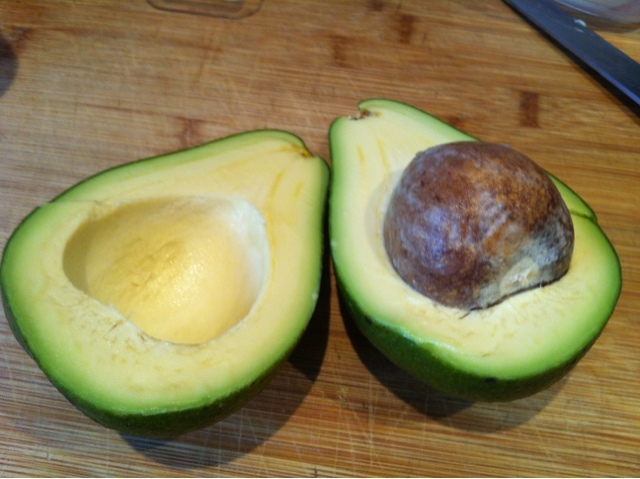 If it's peeled, even better. If it's frozen, de-freeze it first or it won't taste that great. - Boil 1Qt of water + 1 cup of seasoned rice vinegar (I don't even bother with measurements, I pour however much water I think I'll need and dump anywhere from half a bottle to whole bottle if I have a lot of water. As long as it smells strongly of vinegar I'm good with the water to vinegar proportions). - Put shrimp in the water. 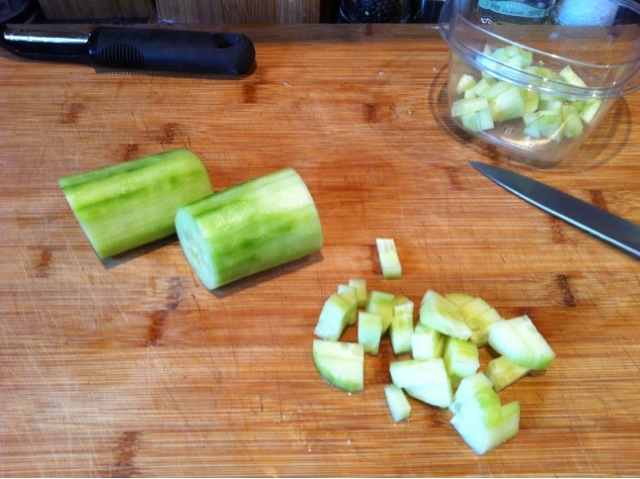 - Immediately take the pot off, cover and let stand for 3 minutes. 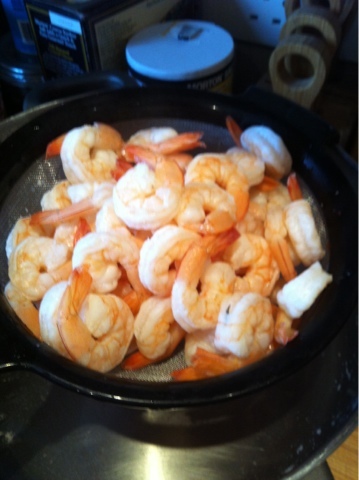 - Drain shrimp, let it cool. 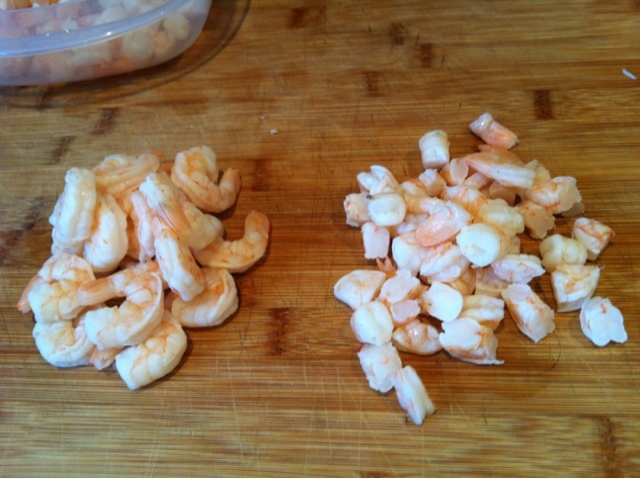 Step 4: Peel and cut shrimp. 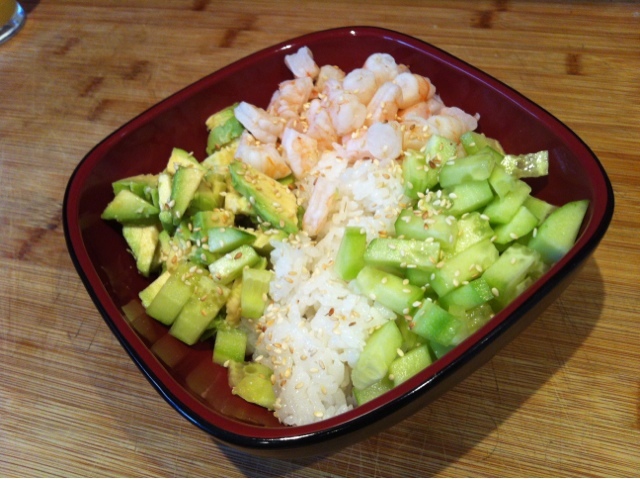 Couple scoops of rice, arrange shrimp, cucumber and avocado on top, sprinkle some roasted sesame seeds if you want, and you get some epic yumminess! That amount usually lasts me for 3-4 meals when I'm alone, but with my husband we get 3 meals out of it. I keep all the ingredients in the separate containers and just add however much needed once I'm ready to eat. Remember, you can adjust the amounts of ingredients to suit your fancy. this looks so good and easy, even i can do it. thanks! of but i think i'll add some pre-cut nori on the side. kind of like a make-your-own sushi kind of thing.